“One night I was riding in the car with a couple of my friends. I had my cell phone out and was dialing a number when suddenly I felt a weightless sensation. I looked up and realized the car had veered off the road and was hurling through the air. We plowed over a road sign, and that’s when I dropped the phone, closed my eyes and waited for the impending crash. The “crash” was actually multiple impacts and lasted about 15 seconds. 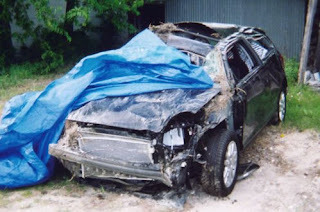 The car ended up both rolling over and flipping end over end, shearing a few trees in the process. The car eventually landed upside down and slid about 50 feet across an open field. 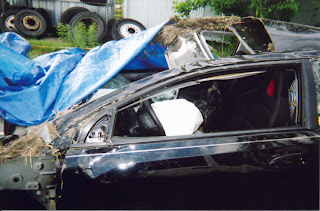 Half the car’s roof was torn off, so when the whole thing was over I was hanging by my safety belt with my head in the dirt.